The Spanish-style pipe organs of Oaxaca, Mexico, have been recognized and appreciated for years by experts and have recently come to the attention of the general public. However, because of the lack of recordings, the restored organs have been heard only by those fortunate enough to be present during live concerts. Now the Instituto de Órganos Históricos de Oaxaca offers a series of recordings, “Historic Organs of Oaxaca, Mexico,” which makes the sound of these fascinating 18th-century instruments available to everyone. 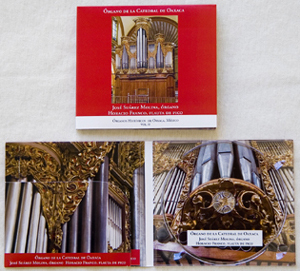 The first four CDs, recorded live during our International Organ and Early Music Festivals, transport the listener into the baroque churches of San Jerónimo Tlacochahuaya and the Oaxaca Cathedral and reveal the arresting tone characteristics of their meantone-tuned organs, masterfully restored during the 1990s by organbuilder Susan Tattershall. 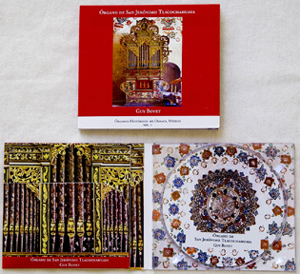 Each CD includes a 20-page booklet in English and Spanish with color photos and text about the organs by Barbara Owen and Cicely Winter. 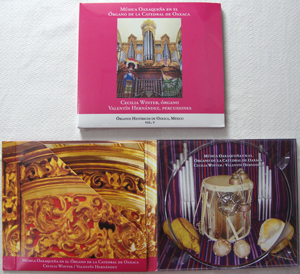 The fifth CD offers contrasting repertoire: Oaxacan folk music played on the Cathedral organ and accompanied by percussion instruments. It includes a 16-page booklet in English and Spanish with color photos and text about the organs and the program by Cicely Winter. 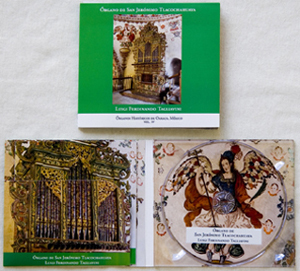 We highly recommend these recordings to aficionados of the Spanish organ repertoire, of the pipe organs of Latin America, Mexico and Oaxaca, and of Oaxacan folk music. “OAXACAN FOLK MUSIC PLAYED ON THE OAXACA CATHEDRAL ORGAN"
(organ built 1712, restored 1996; recorded November 2012—January 2013, total playing time 1:04:27). This recording presents an unexpected combination of two aspects of Oaxaca’s rich musical heritage–today’s vibrant folk music played on a pipe organ from the colonial past. However, this is not as strange as it may seem. This music is typically played by local brass bands, and the organ, the largest of the wind instruments, is capable of sounding like a complete band in itself. Its numerous rows of pipes sound like trumpets and flutes, each with a distinct musical character, and produce a greater variety of sounds than any other instrument. By pushing and pulling the stop knobs on the front of the organ, the organist may select any combination of sonorities, creating startling tonal effects that enhance the emotional impact of the music. The organ is complemented here by various percussion instruments: the standard combination of bass drum, snare drum, and cymbal, along with rattles, a triangle, a scraper, a traditional village drum and a conch shell trumpet. Although these folk songs and dances originated in different regions of the state, the distinct musical traditions have fused into one inclusive repertoire, which is presented every year during the spectacular Guelaguetza performance. All Oaxacans know this music, and it is a vital part of any local celebration. There are songs of love, of life after death, and of longing for Oaxaca by those working far from home. There are also dances with lyrics, many of which praise Oaxacan women, and dances with instrumental accompaniment. References to birds and other animals abound. We hope that this recording will not only delight its listeners, but also inspire them to go hear the actual organs. We also hope that those Oaxacans lucky enough to have a restored organ in their church insist that it be played more regularly. Three hundred years after their construction, the Oaxacan organs remind us that the beauty of their sound is timeless and still relevant in a constantly changing world. LUIGI FERDINANDO TAGLIAVINI performs a richly varied program of works by 16th – 18th century Italian (Storace, Frescobaldi, Pasquini, Scarlatti, Cimarosa) and Spanish (Bruna) composers on the organ of San Jerónimo Tlacochahuaya (built before 1735, restored 1991). Although the Oaxacan organs were built according to Spanish models, Tagliavini´s concert demonstrates their versatility in transmitting non-Spanish repertoire as well (recorded March 2005, total playing time 58:51). ROBERT BATES presents the first solo recital ever recorded on the restored organ of the Oaxaca Cathedral (built 1712, restored 1996). His virtuoso program combines works by Spanish (Correa de Arauxo and Cabanilles) and North German (Sweelinck and Scheidt) composers and brilliantly demonstrates the diversity of sounds of one of Oaxaca´s largest and most versatile pipe organs (recorded March 2005, total playing time 45:39). 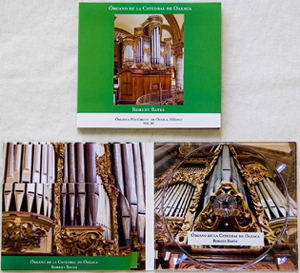 The 8´ organ of the Oaxaca Cathedral (built 1712, restored 1996) is featured in the second volume of the series. This concert by Mexican artists JOSÉ SUÁREZ, organ, and HORACIO FRANCO, recorder, presents works by Bach, Fontana, and Vivaldi, two sonatas by anonymous 18th century composers based on manuscripts from the archives of the Mexico City Cathedral, and a 17th century “Battle” piece for solo organ (recorded December 2001, total playing time 59:13). In the first volume of the series, Swiss organist GUY BOVET performs on the organ of San Jerónimo Tlacochahuaya (built before 1735, restored 1991). His exciting program presents works by Spanish composers of the 16th – 18th centuries (Cabezón, Correa de Arauxo, Cabanilles, and Nebra), as well as a 10 minute improvisation on Oaxacan folk themes (recorded November 2001, total playing time 45:19). the store of the Museo de Filatelia (Reforma 504), El Sonido Discotheque (Hidalgo 608-C, by the Zocalo), Santo Domingo Textiles (Macadonia Alcala 503-2, in front of the Santo Domingo church) and at the IOHIO concerts.